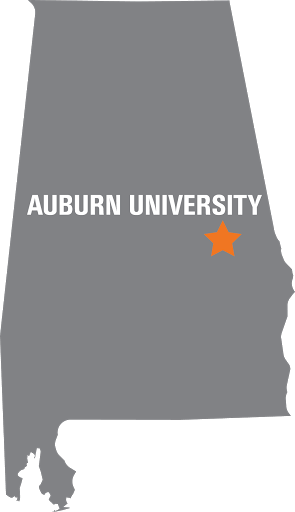 In an effort to recruit outstanding graduate students, the college offers fellowships to a select group of candidates who have the potential to excel in graduate studies at Auburn. Established in 2007, the program has grown steadily with hundreds of students receiving fellowships. Through a generous gift from Walter and Virginia Woltosz, the college is able to offer graduate fellowships to students who demonstrate outstanding scholastic accomplishments. The Woltosz’s gift is instrumental in sustaining the success of this program, and fellowship recipients are known as Woltosz Fellows. In 2018, Charles Gavin significantly enhanced the college’s efforts in this area with the creation of the Charles E. Gavin III Fellowship Program for doctoral students. Gavin’s transformational gift has allowed the college to grow this vital program, and the doctoral fellowship recipients are known as Gavin Fellows. Fellowships are structured as financial supplements to departmental graduate research assistants (GRA's) and Graduate Teaching Assistants (GTA's) offers and include tuition fellowships. Dean's-level Fellowship: The dean's-level fellowships provide a $12,000 annual supplement to a GRA/GTA appointment with a minimum stipend of $20,000 per year. The total direct financial support provided to the student is a minimum of $32,000 annually. Dean’s-level fellowships are awarded only to doctoral students for a duration of up to four years. College-level Fellowship: These fellowships provide a $6,000 annual supplement to a GRA/GTA appointment with a minimum stipend of $18,000 per year. The total direct financial support provided to the student is a minimum of $24,000 annually. College-level fellowships are primarily awarded to doctoral students for a duration of up to four years, while a limited number of college-level fellowships may be awarded for a duration of two years for master’s students. The student maintains satisfactory progress towards the degree as determined by the Graduate School, the department and the student’s major professor. Tuition Fellowships provide a full tuition waiver for graduate students with a 33 percent or greater full-time-equivalent (FTE) assignment. Both GRA's and GTA's are eligible.